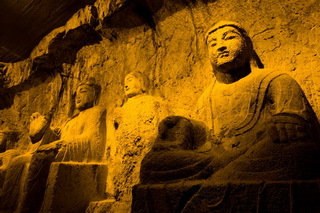 Longman Grottoes, located 13 Km to the south of Luoyang, are a treasure house of ancient Buddhist cave art. 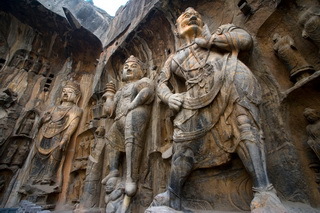 The grottos were hewed and carved during the Northern Wei Dynasty (386-534), when the rulers relocated their capital at Luoyang near the end of the 5th century. At that time Buddhism was spreading east into China and was venerated by the imperial court. 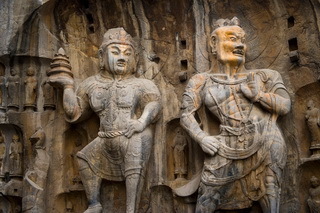 The Buddhists adopted the practice of carving rock temples, dedicated to the Buddha. The most impressive figure is the statue of Vairocana Buddha sitting cross-legged on the eight-square lotus throne. It is 17.14 metres in total height with the head four metres in height and the ears 1.9 metres in length. Vairocana means illuminating all things in the sutra. 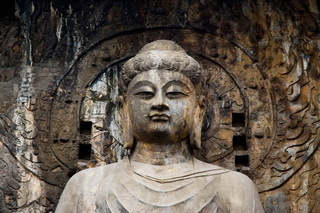 The Buddha has a well-filled figure, a sacred and kindly expression and an elegant smile.